5 or 6 Day Vancouver Island Guided Adventure Tour. Luxury Camping and Adventure. Choose between our 5 or 6 day Vancouver Island tour option for the same price! This Vancouver Island adventure tour brings you the true West Coast experience without (too much) beating around the bush. Start your Vancouver Island adventure in Victoria with a guided city tour, featuring all the must-see highlights of BC's capital city. Your Vancouver Island tour high lights the dramatic and picturesque West Coast of Canada, so where better to head than Port Renfrew! Spend a day exploring prolific beaches and ocean gems, filled with an abundance of easy to spot marine life. After passing directly beneath some of the biggest old growth trees in the world we roll over to a gorgeous lake to enjoy a night of camping beneath the stars. Hop aboard a real packet freighter and experience seldom seen working ports and inlets along the way to Tofino and Ucuelet for an optional cruise, keeping your eyes peeled for humpback whales, porpoises, orcas and sea lions while passing through a paddler's paradise in the Broken Group Islands. You can also opt to stick with the van and enjoy a scenic ride through some of the biggest mountain ranges on Vancouver Island along the way to the coast. Fall asleep with the relaxing roar of the ocean in your ear, and the salty sea breeze delighting your senses during your Vancouver Island adventure tour. Spend the next day of your camping tour in Tofino exploring lush rain forests, and going for long walks on sandy beaches that seem straight out of a postcard. 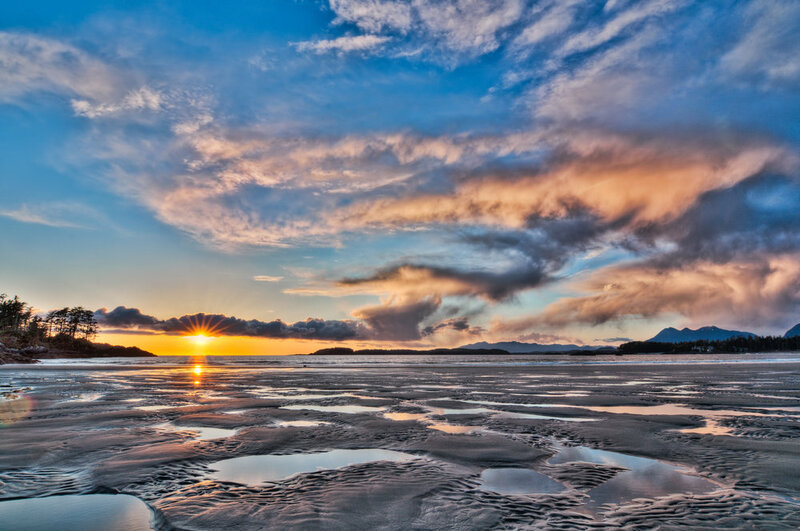 Head out on an optional high speed ocean cruise to a secluded set of hot springs, or opt to spend some time on your own checking out the artisan shops and lively fishing ports of Tofino. No Vancouver Island adventure is complete without trying surfing, so you can choose to spend the afternoon tearing it up at the pristine beaches with your guide, or catch up on some relaxation on the warm sandy beach. Enjoy an incredible drive along the "Highway of Waterfalls", then check out the world famous "Goats on the Roof Market" before being dropped off at your hotel, bus station or ferry terminal in Nanaimo. With high quality gear provided, healthy gourmet food prepared each day and local guides who can take you to the little known secret gems along the way this Vancouver Island adventure tour is ready to make your time here unforgettable! Pick up from your central Victoria hotel. Drop off in Nanaimo at Departure Bay ferry terminal with access to Vancouver, Nanaimo airport shuttle and downtown Nanaimo hotels. We cater to all fitness levels. charge ahead or relax. Gourmet and fresh food prepared by your guide for all diets. Our menu features tons of healthy, local food. All meals are included from pick up to drop off. Comfortable and eaasy camping as a group with hot showers available most days. Single or double occupancy in high quality 2 or 3 person tents with good sleeping pads. Sleeping bag (or rent one), your personal clothing plus good walking footwear, towel, bathing suit, daypack, sunscreen, water bottle, sunglasses and camera. Victoria city tour, daily hiking excursions, Tofino free time and swimming. Optional surfing, Barkley Sound cruise and Tofino ocean excursion. Tour Itinerary (may change slightly due to weather or availability of activities. This is roughly what to expect). Day 1: Victoria city tour- We gather you up from your Victoria hotel or Victoria airport and get to know everyone before starting our grand tour of Victoria's quaint harbour and downtown. Victoria has a wealth of historical landmarks to wonder at, and picture how it has changed over the last hundred years. After our tour we head West out of the city and to the Pacific Coast where we camp with a commanding view of the Olympic Peninsula. Set up your tent below lofty old growth trees, and next to luscious Salal berry bushes. Feast beneath open skies and talk about the exciting days ahead of us. Day 2: Port Renfrew and giant trees-Load up on a fresh, healthy breakfast before hopping in the van and continuing North along the West Coast of Vancouver Island. We stop to marvel at the gigantic trees and bountiful tidal pools around quiet and rugged Port Renfrew, then watch the landscape change as we pass through the Cowichan Valley. Stand beneath the tallest trees on the coast in Cathedral Grove before settling down to camp on the pleasant shores of Sproat Lake. Watch the sun set as we enjoy a hearty meal. Day 3: Barkley Sound-Wake up bright and early to a tasty breakfast, then load up on the Francis Barkley for your scenic cruise through Barkley Sound on this working packet freighter. Stop in at places seldom seen along its voyage through the distant corners of the sound, entertained by the efficiency of the working crew loading and unloading supplies at each remote port. Watch for humpback whales and bald eagles as you steam past the Broken Group Islands, and sea lions and seals as you pull into Ucuelet. We head North towards Tofino, legendary surf and adventure town and one of the furthest west destinations in Canada. Explore endless beaches and rain forests, smelling the salty air and spotting eagles overhead. Set up camp at Bella Pacifica campground right on the beach,while watching the brilliant west coast sun set. Day 4: Tofino-How could we enjoy being near the Pacific Ocean more than embarking on a high speed boating excursion through the deep fjords of Clayoquot Sound. We cruise through rugged landscapes, tamed by no man on our way to Hot Springs Cove for a soothing soak in the natural hot spings. AAlternatively you can opt to take some leisure time to explore the town of Tofino, or try out surfing in Canada's surf paradise! Day 5: More Tofino time!- This year we have added an extra day in Tofino, since we couldn't possibly scratch the surface in just two days. Today you can hit the water again on a guided kayaking tour deep in the sound, or go on a marine bear watching tour. If the surfing fever is taking a hold you can always hit the swell again and perfect your moves, before going on quick rain forest hike. (Day 5 tour departs at 10 am on an included shuttle to Nanaimo or Victoria along a really scenic drive. You will be in Nanaimo by 2:45 pm or downtown Victoria by 5 pm). Day 6: "Highway of Waterfalls" - Wake up to the sound of the ocean and enjoy a final hearty breakfast. Enjoy a scenic drive along the infamous "Highway of Waterfalls", winding through some of the most majestic mountain terrain in Canada. The 6 day tour ends with a drop off in downtown Nanaimo by 2 pm, with access to the Vancouver ferry, Nanaimo Airport, or bus to Victoria. Expert guide for entire trip. Camping and use of quality tent/ sleeping pad (Dbl Occ). All meals from pick up to drop off. Guided hikes and excursions during entire tour. Trip cancellation/ travel medical insurance. Personal expenses before and after tour. All prices are subject to a 5% local tax. Prices are subject to change.